Farmer whose greenhouse in Gaza-area community was set on fire by Gaza infiltrator describes the damage. 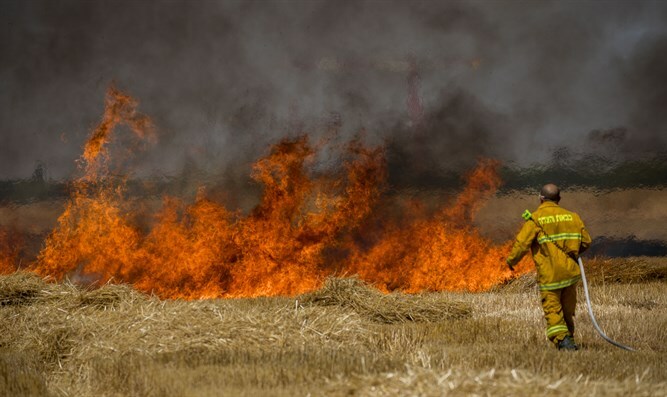 Udi Dreilich, the farmer from Moshav Netiv Ha'asara whose greenhouse was set on fire by a terrorist from the Gaza Strip, said the damage was estimated at hundreds of thousands of shekels. "All the equipment I had, which I collected over the years - everything was burned. This is a very serious as far as I’m concerned, and luckily it did not end with casualties. I hope they will draw conclusions and that it will not happen again," Dreilich told Kan 11. The terrorist, who infiltrated Israel on Friday night and set fire to the greenhouse, had already infiltrated between six and eight times before. Sources in the defense establishment say that he is apparently trying to get caught in order to enter Israeli prison. The commander of the northern brigade of the Gaza Division, Col. Avi Rosenfeld, visited Netiv Ha'asara, where residents were outraged at the “unbearable ease with which a Palestinian enters and causes tremendous damage. And what if he was armed? " Colonel Rosenfeld promised them, "We will beat them. We will learn from what we need to." The terrorist penetrated some 700 meters into Israeli territory, setting fire to a large storage room with equipment and a greenhouse. Dreilich does not accept the IDF's claim that the terrorist was under surveillance and claims there was a failure. "The residents are all over the area, there are active businesses that work and citizens who come from all over the country to buy seedlings and flowers," Dreilich said. "It could have ended completely differently. What the army says is not comforting."